Leadership, professionalism and skilled seamanship ensured the rescue of 907 migrants. Captain Jamie Wilson was in command of the UK-flagged multi-purpose ROV (remotely operated underwater vehicle) support vessel Deep Vision when, between 28 January and 1 February 2017, the ship, which was on a commercial charter in the Mediterranean, participated in a series of nine search and rescue operations off the coast of Libya. He and his crew helped to rescue a total of 907 migrants – including a significant number of women and children. They provided emergency assistance, including water, food and lifejackets to those in distress and helped to transfer survivors to coastguard, naval and humanitarian support vessels. Deep Vision, as a ROV vessel conducts underwater survey work among other activities. It is 89 metres long with two bow thrusters, two stern thrusters and two controllable pitch main propellers. It has a helideck. She normally operates with 55-60 people onboard and can accommodate 70. The crew is 17-19 strong depending on the operation. In a remarkably concentrated period of time, they gave essential support to emergency services and responded promptly and professionally to distress messages. They worked intensively to provide frontline assistance to migrants on extremely overloaded RIBs, providing a lee to minimise the effects of the sea conditions until those onboard had been safely recovered. 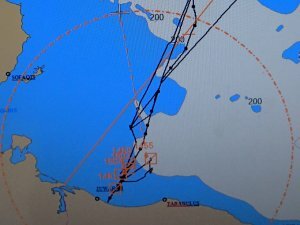 The events all happened approximately 14-40nm from Libya (and 120nm south of Lampedusa) and the coastal city of Zawia from where most of the migrant boats/rafts apparently depart. The vessel was also on an increased security level being in Libyan waters so, not only were the crew dealing with migrants, they were also implementing additional security measures. The first incident took place on 28th January. Deep Vision received a distress message relayed from MRCC Rome and was instructed to proceed with all available speed to assist a migrant vessel in distress. The wind was SSW force 4 with a 1 metre sea. This was the first time any of the crew including Jamie had been involved in any type of rescue at sea. 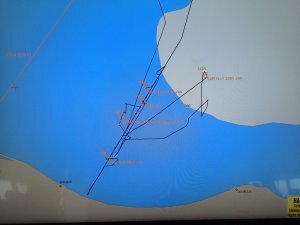 There were a few distress positions at first and Deep Vision conducted search patterns along with Coastguard vessels until a raft was located. They were then designated On-Scene Commander as further vessels arrived. Dynamic positioning was used to maintain position for launching the rescue boat to aid those in the raft. There had been two fatalities in the raft, young children, which had a large emotional impact on the Captain and crew. A French naval vessel arrived and took care of the bodies and took the 84 men, 23 woman and 25 children onboard for passage to Italy. The second incident took place the next day in similar conditions. A migrant vessel was spotted on radar heading towards Deep Vision. Their rescue boat gave out water, food and life jackets to the 125 migrants who were on the raft until the rescue ship MV Aquarius arrived. For the third incident on 31st January Deep Vision was again On-Scene Commander. There was a westerly wind force 3 with a 1m sea. This was a night time operation which made manoeuvring more testing. During the operation the wind increased to 25 knots and with it the sea state but the migrant boat was wooden and a little more seaworthy than the rafts. Manoeuvring to provide a lee was conducted using manual controls. The migrants were transferred to an Italian Coastguard vessel. The next six rescues involving 650 migrants took place on 1st February with weather conditions similar to the previous day. Fatigue was now an issue because the previous rescue had taken all evening. So with only a few hours sleep Deep Vision’s crew was faced with multiple boats all in close proximity and all overcrowded. Manoeuvring was conducted using hand steering moving from one raft to the next to provide assistance until the migrants were taken off by an Italian Coastguard vessel. All 6 SAR events that morning happened within the space of 6 hours. 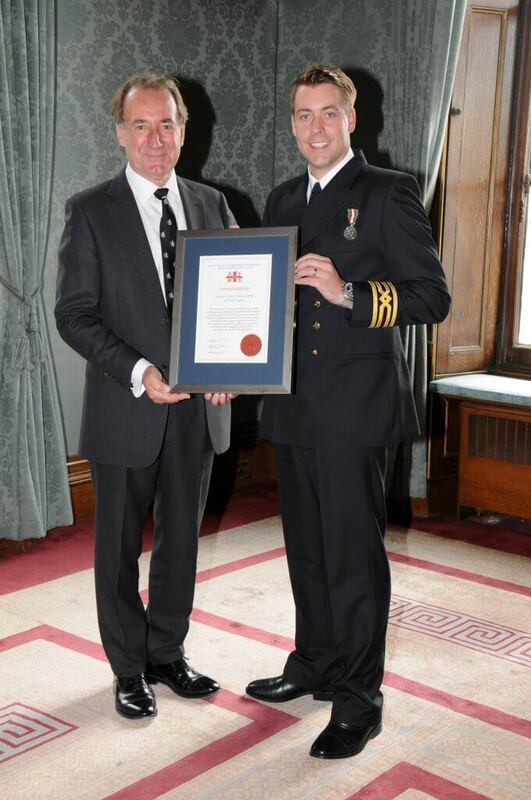 Captain Jamie Wilson led his team with immense dedication and professionalism, exercising high standards of seamanship and upholding the finest traditions of the sea in going to the aid of those in danger. Fellow crew members spoke highly of his support in very difficult and emotional circumstances.